Today was just as hectic as I thought it would be, and it the day isn't over yet! My breakfast (pictured last post) held me over 'till about 11:30, but I didn't get to eat until 12:15. 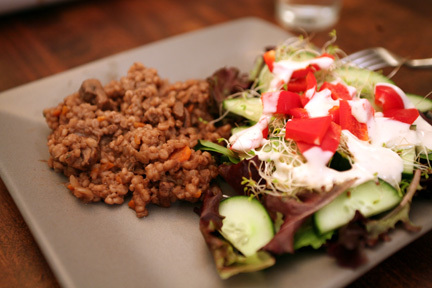 It took me about an hour to eat the lunch I packed (pictured last post) because I was so busy. 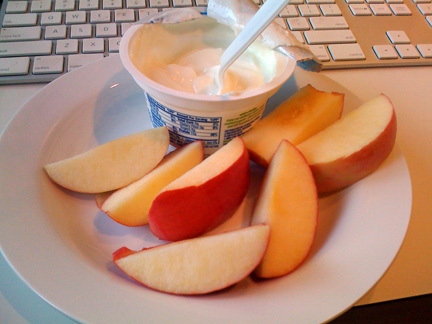 I was hungry again by about 5:00 and ate my yummy snack, pink lady apple slices dipped in Oikos plain yogurt. The sweet/tartness of the apple perfectly balanced the yogurt...so good! I left work at 6:00 and came straight home to do a Taebo workout dvd. It had been FOREVER since I had done one of these, so I started with a basic workout. It was way too short so I did another to get about 35 total minutes of fast-paced cardio and 20 minutes of stretching. I decided that I wanted to be an architect when I was in 6th grade. I finished my undergrad degree in architecture, worked for 2+ years in an architect's office, finished my graduate degree in architecture...and now work in a landscape architecture office and LOVE it. Go figure. I'm part Finnish, and my maiden name had the classic double vowels of a Finnish last name (I kinda miss it...). I've had a love affair with peanut butter and bananas since I was a baby. I called peanut butter banana sandwiches "p-bo nannas" when I was 2. I went to Astronaut High School...no, they didn't teach us to be Astronauts. My husband and I lived in the highest incorporated town east of the Mississippi for a year...anybody know what town that is? I'm addicted to looking at real estate listings online, even though we're not in the market to buy a house. I guess I could have worse addictions, right?!? Have a lovely lovely evening!